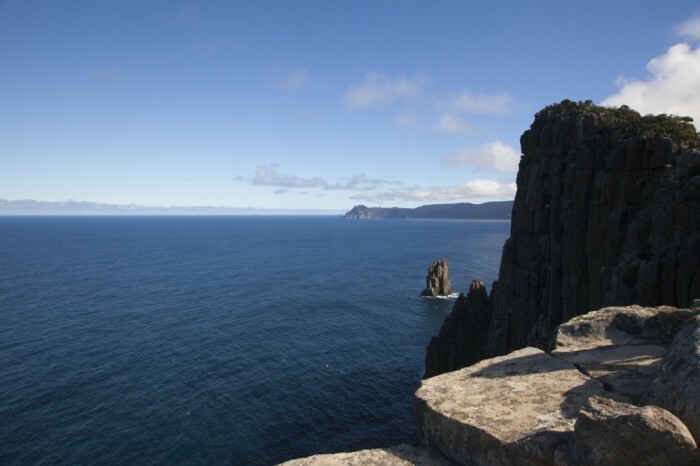 Cape Hauy is the most well-known and accessible walk from Fortescue Bay located within the Tasman National Park and rightly so, it is a well-constructed trail with fantastic views on offer throughout its duration. 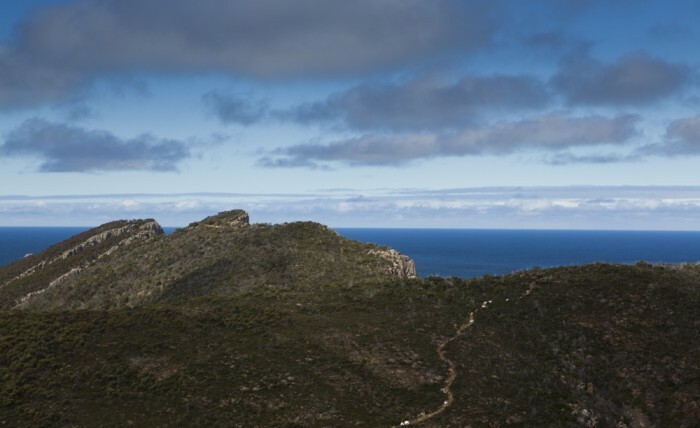 The 8km return walk from the cape can be completed in 4 hours though additional time is recommended to take in the extensive views of the coast and astonishing cliff faces. View Google Map Directions From Hobart head over the Tasman Bridge and continue on the Arthurs Highway (A9), turning right at the main intersection in Sorell (sign for Tasmanian Peninsula). Continue towards Port Arthur, taking the first left after the Tasmanian Devil Park, onto Fortescue Bay Road. This 12km gravel road leads to the Fortescue Bay camping area. The Cape Hauy trail begins next to the boat ramp at the far end of the campground. Starting from the boat ramp end of Fortescue Bay, the Cape Hauy trail heads east following the rocky coastline via a wide and well-constructed track. After 15 minutes of skirting the coast the trail then climbs inland. The track continues to climb for the next kilometre, leaving the She Oaks and Banksia’s of the lower coastline, entering dry sclerophyll forest. Two flat scrublands are then passed before the track climbs again, reaching a trail sign pointing south to Cape Pillar. Continuing past on the left hand side of the sign the track begins to descend to the cape. 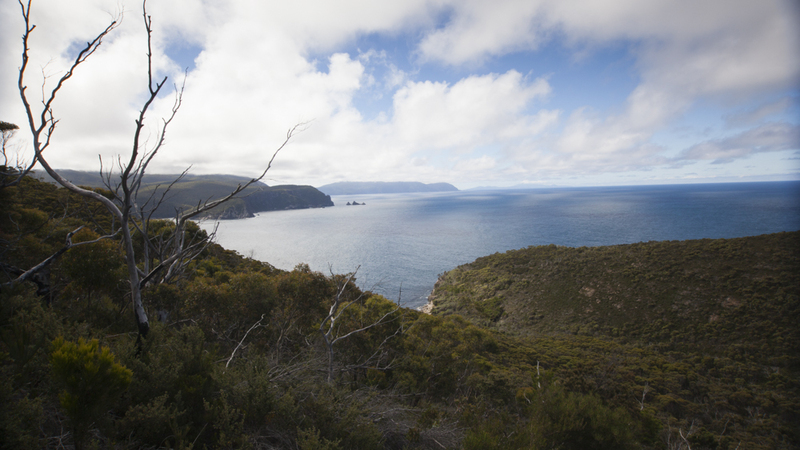 Quickly, the forest opens up presenting you with the undulating slopes of Cape Hauy, with the walking track etched deeply into it. The first scramble down onto the cape is the steepest of the days hiking, but is easily managed. Once at the top of the first saddle extensive panoramic views stretch far north past the Forester coast to Maria Island and south, detailing the ridges of Cape Pillar. For the next 1km the trail rises and falls over the remaining two saddles, passing a large sinkhole on the left. Towards the end the track borders very close to the cliffs edge, providing thrilling views down at multiple points. The final segment of the trail, before reaching a large plateau, is quite steep and narrow care. Once at the end you are able to clearly view the exceptional rock formations of the Candlestick and Totem Pole, large columns of dolerite rocking out of the ocean. The Hippolytes, a large section of rock also sits severed from the mainland just east of you. When returning to the trail head via the same route, a short and worthwhile detour can be made to Monument Lookout via the Cape Pillar trail, 20 minutes return from the sign. The 200m high sheer cliff of Monument Lookout can easily be found, though it is not clearly sign posted. From here exceptional views of Cape Hauy and the Hippolytes can be seen, along with Cape Pillar and Tasman Island. The trail skirts close to cliff edges at points, please don’t fall off. It also can get windy once you get out onto the headland.